Happy 40th wedding anniversary to my wonderful in-laws, Toney and Haven Hudson of Cookeville, TN. Showers and a rumble of thunder through the morning hours will slowly give way to the rain stopping and skies eventually becoming partly cloudy this afternoon. Expect a high of 77° in the Upper Cumberland. We'll dry up for a bit, but rains return in earnest for Monday through Tuesday night. 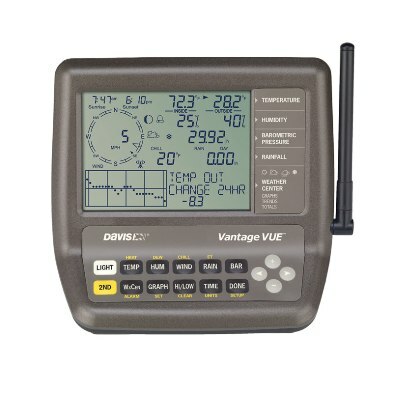 At my LIVE weather station in Cookeville, TN (I use the Davis Vantage Vue pictured above), I've recorded .21" of rain as of 8:25 am. The rain began around 7:10 this morning. Speaking of rain, we wrapped up April with 12.75", breaking the old record from 1920 of 8.91". For the year, we stand at 30.35". Typical total for the year at this point is 20.04. We are 151% over the average! Finally, a personal note from the wife of legendary Alabama weatherman James Spann on the destruction she witnessed with their son yesterday. A very touching article.